Come join the guides and instructors of PPP every Tuesday evening for a paddle for either relaxation, stress relief or just plain FUN. It beats sitting in front of the tube and definitely beats yard work. We meet at the store (1000 Ellicott Creek Rd. 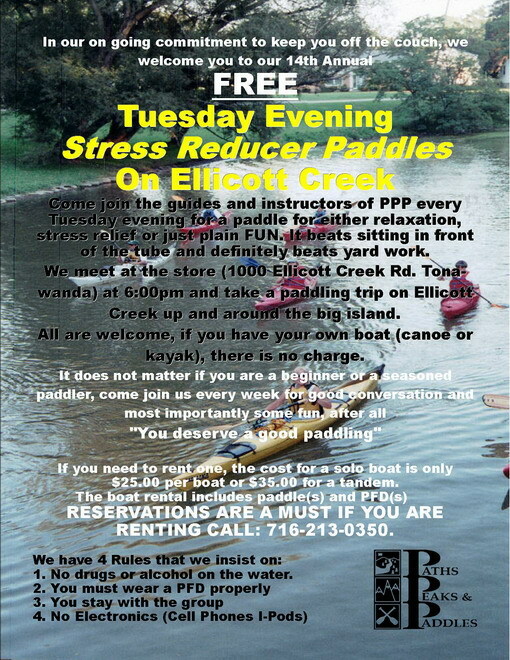 Tonawanda) at 6:00pm and take a paddling trip on Ellicott Creek up and around the big island. All are welcome, if you have your own boat (canoe or kayak), there is no charge. It does not matter if you are a beginner or a seasoned paddler, come join us every week for good conversation and most importantly some fun, after all “You deserve a good paddling”. 1. No drugs or alcohol on the water. If you need to rent one, the cost for a solo boat is only $25.00 per boat or $35.00 for a tandem. The boat rental includes paddle(s) and PFD(s). RESERVATIONS ARE A MUST IF YOU ARE RENTING CALL: 716-213-0350.